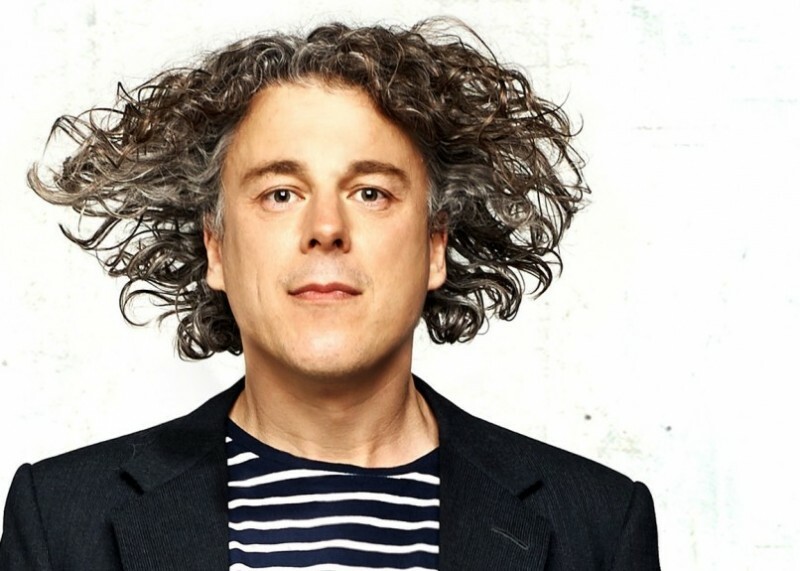 Following the success of his 55-date Little Victories UK tour in 2014, and having already added extra dates this year, Alan Davies is set for a final 15-date autumn leg. That includes a date at Preston Guild Hall in early November, and it’s not the actor and comedian’s first visit. In fact a piece in his entertaining 2009 early-years memoir My Favourite People & Me (1978-88) mentions a 1992 stand-up date played in the same building as Motown legends The Temptations. I reminded him of this as we talked on the phone, Alan occasionally distracted while watching over his children at a soft-play centre in North London. At this point, I only feel it right to burst Alan’s bubble and mention that his daughter may well lose that great taste for a few years while discovering some modern boy band. While he remembered that past Guild Hall date, I put it to him that surely all the towns blend into one sometimes. Or does he take the Mark Steel’s in Town approach – undertaking plenty of local research first? “God, no! Mark’s fantastic. That’s one of my favourite radio programmes. I try to have a potter about though, depending how long I’m in a town for. I’m just hoping there isn’t some massive fireworks display the whole town will go to that night. 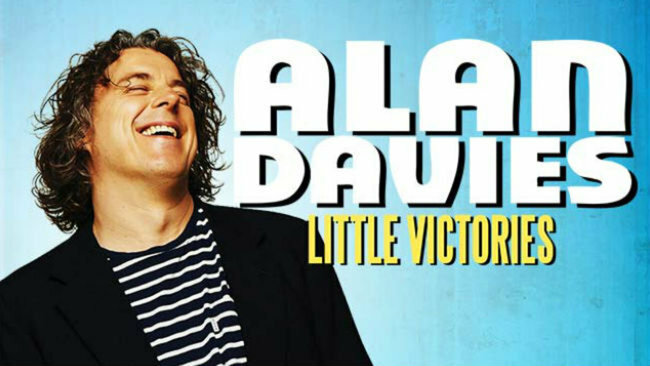 Alan’s final 15 Little Victories dates start at Middlesbrough Town Hall on Friday, October 30th, and end at Bath Theatre Royal on Sunday, November 29th. And like its predecessor, Love is Pain – which was his first UK tour in more than a decade and was also extended twice – does seem to be the tour that keeps giving, this 49-year-old making up for his previous 12-year live hiatus. I’m guessing he’s loving life on the road again. Other than his children or his other half, children’s author Katie Davies, what does Alan miss most about home while on the road? Funny you should mention that. There’s plenty about his love of the Gunners in his 2009 autobiography. How far a walk is it from his North London gaff to the Emirates Stadium? In the style of fellow celebrity Arsenal fan Nick Hornby, is there a certain ritual or route you take on matchdays that might seem embarrassing in writing? Perhaps the fact that your club moved to a new stadium killed all that off. Talking of Davies’ home life, in an interview on this very blog with Julian Cope, he told me his wife and him sit opposite each other writing their own projects most mornings, making sure they’re both properly working rather than going on Ebay, or whatever. Is that the case with Alan and Katie too? The Adrian Gurvitz Suite, I voice, but Alan either doesn’t hear me in his loud soft-play area, or chooses – perhaps quite rightly – to ignore me and carry on. With the current show’s title in mind, what would he say are his most recent Little Victories? “Those Little Victories refer to getting one over on my Dad as a kid, even if was just to get him off the sofa or out of the bath. Whereas my main persuasive technique is just to shout at mine, which I don’t like doing. 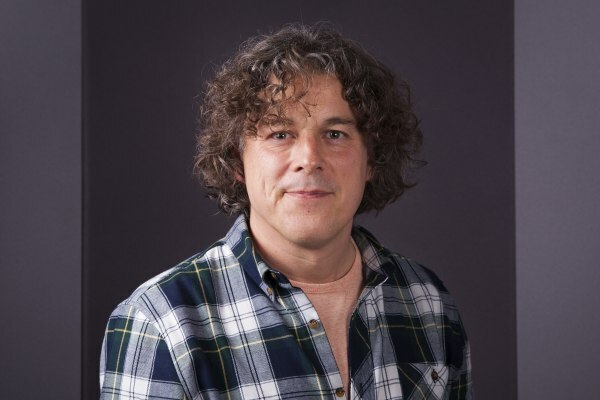 Despite falling back in love with stand-up, Alan is probably still best known as the cheeky resident dunderhead on QI or the star of television drama Jonathan Creek. But it was as a comic that he first found fame, his debut slot at Whitstable Labour Club in 1988. What size audience was he up against then? Alan went on to make his network television debut on Tonight with Jonathan Ross in 1992, and by 1994 having won the Edinburgh Festival Critics Award and seen a Perrier Award nomination. It’s not a bad way to make a living. Then again, Glenn Tilbrook once told me about his nightmare moment while playing live with Squeeze, how he lost his train of thought one night after wondering mid-song if he’d turned the grill off before leaving his house. Ever had any mind-blank experiences like that? 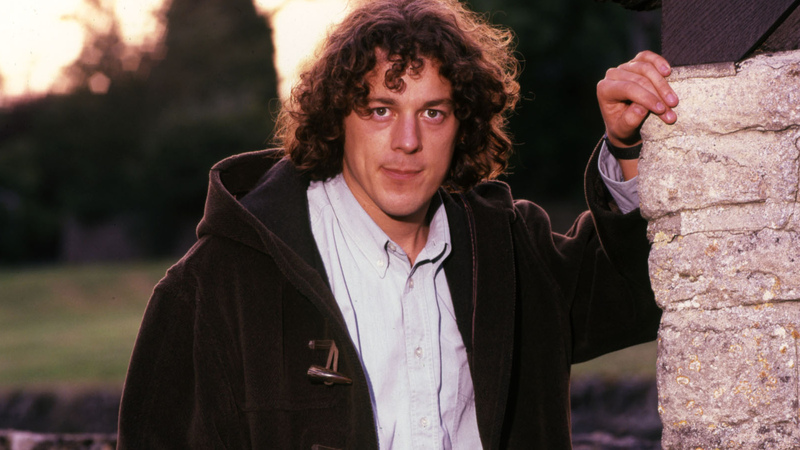 Many high-profile comedy festival appearances followed, around the world, but it was his eponymous role in Jonathan Creek that helped Alan cross over to a mainstream audience. Written by One Foot in the Grave creator David Renwick, the show continues to attract huge audiences and has scooped numerous plaudits, including a BAFTA and a National TV award. And I understand there are more specials to come. Did Alan know David before he got to work on the programme? 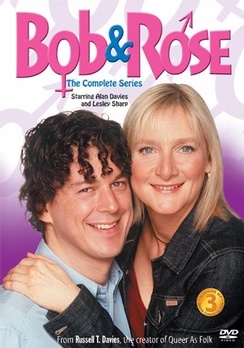 There was also ITV’s 2001 award-winning Bob and Rose, Alan playing a gay teacher opposite Lesley Sharp. The fact that Russell T Davies was the writer means Alan is often mentioned on the list of future Dr Who possibles, not least with his Tom Baker type curls. Is he ready to take over from Peter Capaldi in a few years? After Bob & Rose came another acting role in Auntie and Me, an initial run in Edinburgh leading to a four-month West End run. 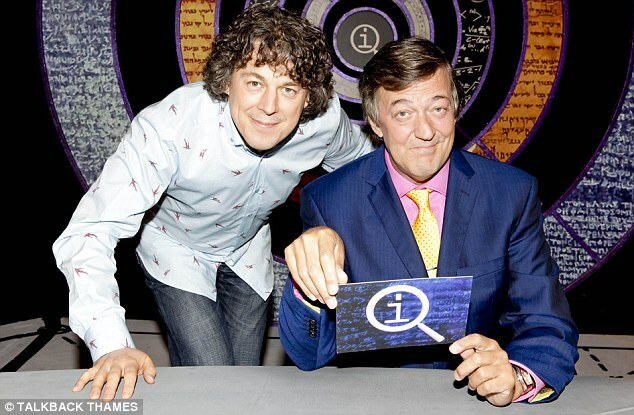 And that same year Alan took part in a certain comedy quiz pilot hosted by Stephen Fry, QI subsequently running every year since 2003. There have been plenty of big roles since, including the lead part in ITV legal drama The Brief, while My Favourite People 1978-1988 was adapted into a three-part documentary series for Channel 4, Teenage Revolution. I enjoyed his 2009 book. This Surrey born’n’bred scribe is barely 18 months younger than Essex-raised Al, and there’s plenty I can relate to from my own childhood, even if I did fall more on the Tottenham and QPR side of the fence in those early years. That said, I appreciate his championing of Liam Brady, and we shared our worship of Pat Jennings. What’s more, there was a mutual sense of wonder in those formative years for everyone from Debbie Harry and Chrissie Hynde to Paul Weller, CND, Tony Benn, Billy Bragg and John Peel, among other names and causes. So are we likely to see part two of the memoir soon, charting from 1989 onwards? Well, that’s just wrong. Perhaps you shouldn’t worry about snaring the average readers. “Some of the chapters I’m quite proud of, and I took a lot of care over it and worked hard on it. So it’s heartbreaking when someone makes the assumption it’s a ghost-written celebrity bit of nonsense. That’s the battle. 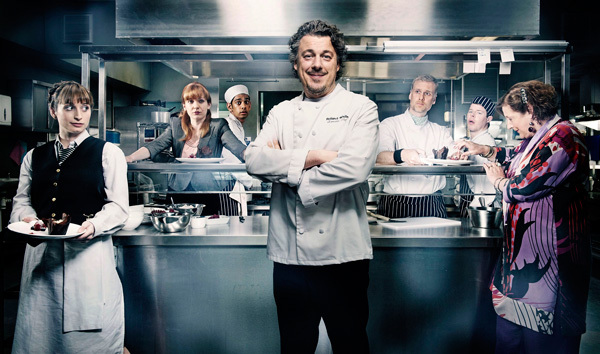 Alan laughs again, but you can tell it rankled, similar to the way he felt after the BBC lost faith in his sitcom Whites, in which he played the lead role of chef Roland White. More recently, as well as his Jonathan Creek and QI appearances, there’s been the Davies-hosted Dave show As Yet Untitled. And it appears there’s more of that to come. I’ve been enjoying As Yet Untitled. If you were invited on as a guest, what stories would you tell which people might not know about? Do Alan’s children have any real concept of what he does for a living yet? Bill Bailey was best man at Alan and Katie’s wedding. I’ve an interview to write up after talking to him recently. Does he see a lot of him? Talking of half-centuries, Alan reaches that landmark himself next March. Is that a daunting prospect? No plans to ride a motorbike across America or something like that, to mark the occasion? “I’d love to do all these things, but small children change your entire life. It’s not my time. The thing about having children so late is I’m not going to resume my life again until I’m about 75! And for full tour details of the last leg of Little Victories, check out this link. 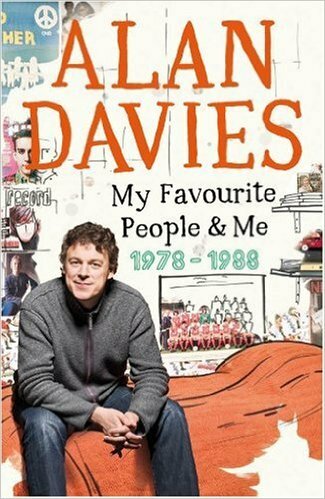 This entry was posted in Books Films, TV & Radio, Comedy & Theatre and tagged Alan Davies, Arsenal, As Yet Untitled, Bill Bailey, Bob and Rose, David Renwick, Jonathan Creek, Katie Davies, Little Victories, My Favourite People & Me, Preston, QI, The Brief, The Temptations, Ulrika Johnson, Whites, Whitstable. Bookmark the permalink. Reblogged this on ''My Kind Of Wonderful''™ ~~ My Blog ~ My Life ~ My World ~ My Ramblings & Other Bits! ~~ ♣♥♠♦ ~ ♣♥♠♦ ~ ♣♥♠♦ ~ ♣♥♠♦ ~ ~♣♥♠♦ ~.